Gratitude can be a hard muscle to flex, especially if you aren’t exercising it regularly. But developing a daily gratitude practice makes it easier and easier to approach your life with an attitude of gratitude. The more you practice, the more proven benefits you’ll see. And those benefits definitely come in handy when life hands you obstacles and you need to feel gratitude the most. 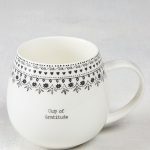 One way to begin integrating a gratitude ritual into your life is to tie it into an already essential part of your day: teatime! This quiet time carved out just for you is the perfect time to reflect on the positivity in your life. And one effective, tangible way to incorporate grateful thought into your life is by using a gratitude journal. We’ve compiled a list of essential tools to make your tea time and gratitude journaling session the best part of your day. If you’re reading this, then you’re probably already a huge chai lover (and we are so grateful for you). Your go-to tea is a wonderful companion for some reflective journaling, but selecting a new flavor or recipe can help infuse gratitude into other aspects of your life. For instance, imagine you’re regularly a vanilla chai latte drinker but starting drinking Salted Caramel during your gratitude journaling sessions. 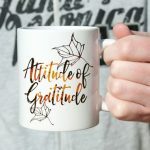 Then whenever you drink Salted Caramel chai – at home or work or anywhere in between – you’ll associate the sweet-but-salty comforting flavor with gratitude and be reminded of all you’re grateful for. There’s something particularly exciting about a brand-new journal filled with crisp, clean pages. When it comes to gratitude journaling, you have a few options. If you prefer guidelines and structure when starting a practice you’re unfamiliar with, a guided gratitude journal could be the best fit for you. If you prefer to forge your own process, or prefer more freeform writing and/or drawing to express yourself, a blank journal provides endless options. Or keep with the teatime theme with this customizable journal! Do you have a gratitude practice success story to share? Please share it with us in the comments. We always want to hear more about how you make your life and your teatime even more special. Don’t forget to subscribe to our newsletter and follow us on Facebook, Twitter, Instagram and Pinterest. I would love to have one of the yellow cups. 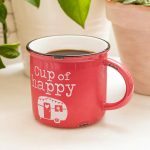 I agree, I would love to purchase the bright yellow Oregon Chia mug!